From Abu Simbel To Aswan. Day 02: Set sail early morning to Kasr Ibrim. Set Sail to Amada. Overnight in Amada. Day 03: Visit the temple of Amada. Set sail to Wadi Essbou. 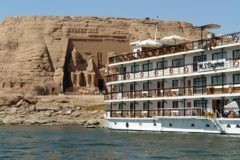 Set sail to Aswan. Overnight in Aswan. Day 04: Visit the temple of Kalabsha. 900 $ per twin cabin (two people). 720 $ per single cabin. Meals from lunch on first day till breakfast on last day. Any other tour is not mentioned above.